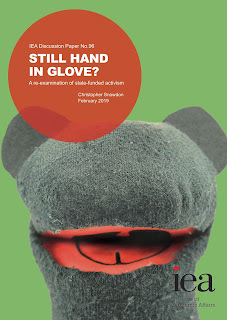 It's been seven years since I first published research with the IEA about state-funded activism, and five years since I last tackled the subject in The Sock Doctrine. I showed in these reports that large sums of taxpayers' money were being given to non-governmental organisations by central government, local authorities and the European Commission. It is undeniable that some of this money was being used to campaign for controversial legislation, regulation and taxation. In some instances, statutory funding made up 100 per cent of the organisation's income. This raises several questions. Is it ethical to force taxpayers to fund political campaigns with which they may strongly disagree? Is an NGO really 'non-governmental' when it relies on the state for most or all of its funding? And to what extent is civil society crowded out of the political conversation by this legion of quangos and state-funded pressure groups? 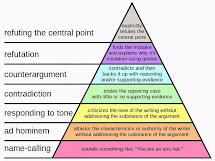 Insights from Public Choice Theory suggest that there is an 'iron triangle' of policy-making consisting politicians, bureaucrats and pressure groups (think of Yes, Minister). Using taxpayers' money to create and fund pressure groups can be seen as a way of politicians and bureaucrats taking control of the third corner of the triangle. It amplifies the voices of those the government wants to hear from and makes 'civil society' less unruly (from its perspective). I have revisited the topic in research published today (Still Hand in Glove?) to see how the landscape has changed. There are reasons to expect statutory funding of politically active NGOs to have declined since 2012. Firstly because there have been budget cuts in many areas of UK government spending. Secondly because, since December 2016, contracts between central government and external organisations have specifically stated that grant money cannot be used for campaigning, advocacy and lobbying. Billions of pounds are granted to third parties by the UK and EU governments every year. The sums involved are so large that it is almost impossible to conduct a full audit, but by revisiting the organisations studied in previous IEA reports, we can get a series of snapshots. In summary, it seems that there has been a decline in government spending on NGOs at the Whitehall level, with the exception of foreign aid charities which have benefited from David Cameron's commitment to spend 0.7 per cent of GDP on international development. At the EU level, it is a different story. 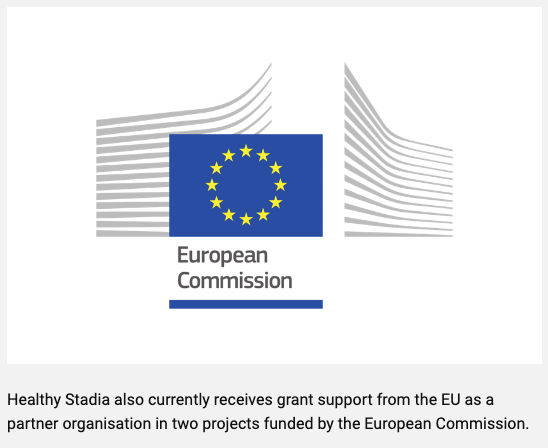 Most of the organisations mentioned in my Euro Puppets report have seen their grant funding increase, and many of them continue to rely on the European Commission for most of their income. Environmental lobby groups have done particularly well. The Scottish and Welsh governments have also continued to fund political advocacy organisations. In what I call the 'nanny state blob', groups like Alcohol Focus Scotland, Obesity Action Scotland and ASH Wales rely on taxpayers for most or all of their income. Despite bearing the brunt of budget cuts in recent years, many local councils are still able to find money for similar organisations, with the focus shifting from tobacco to food in recent years. 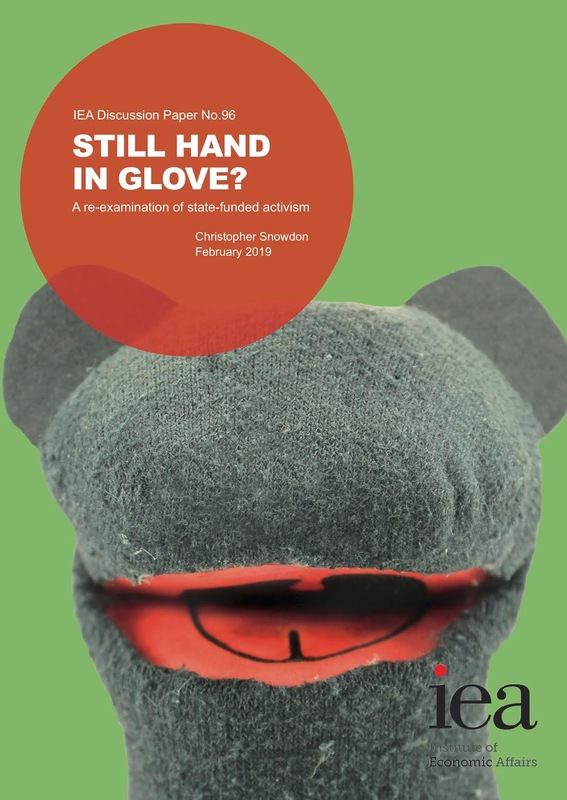 In England, the kind of activity described in Sock Puppets, in which state-funded charities and NGOs masquerade as citizens’ action groups, does seem to have waned, but this may be partly because the creation of Public Health England in 2013 made them redundant. The tendency now is for activists to go from putative outsiders to overt insiders by joining wholly state-funded organisations such as Public Health England, the Obesity Policy Research Unit or the Tobacco Control Research Group which nobody could mistake for grass-roots organisations. Whilst this is an improvement of sorts, mutual back-scratching remains, notably in the green and nanny state blobs, which serves to exclude the most important stakeholder: the consumer. You can download Still Hand in Glove? here. 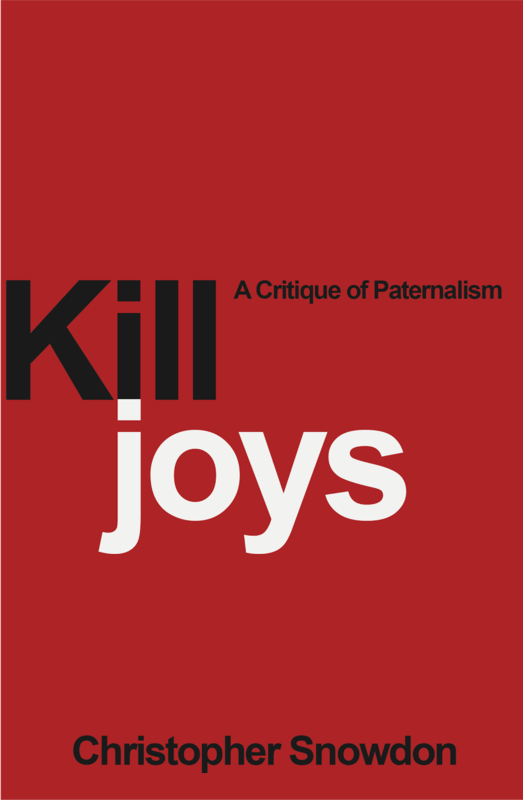 I was on the Free Thoughts podcast recently discussing paternalism, John Stuart Mill and other themes from my book Killjoys. Not enough is written about the ethics of 'public health' (spoiler: it's unethical) so it is always nice to see a new critique. This article by Ronald W. Dworkin is an absolute belter. As I argued in Killjoys, the public health movement turned pernicious when it went beyond it's remit of tackling contagious disease and decided to use coercive measures against anything that could conceivably have an effect on an individual's health, including - in fact especially - self-regarding choices made by the individuals. It is now an authoritarian political movement masquerading as a branch of medicine. ... lack of humility has emboldened public health to insert itself into practically every conceivable public policy debate. Along with its traditional menu of concerns, including sanitation and immunization, the public health field now voices opinions on such issues as gun control, mental health, drug abuse, domestic violence, social justice, gender equality, sustainability, wealth redistribution, children’s day care, and foreign policy. This is arrogance of the long-sighted kind. Public health activists drape themselves with the scientific method, declaring, “Why should not a method of investigation that has succeeded so well in solving problems in medicine be used to improve people’s well-being in a social, ethical, and political sense?” Because public health has a bona fide link to science, through medicine, which no social scientist can lay claim to, it has transformed itself into science’s emissary to policy debates once thought far removed from science. The fact that almost every life problem spills over into the public realm eventually, while also touching on somebody’s physical or mental health, makes public health’s portfolio potentially limitless. Not even social science claims such a range. Arrogant because public health experts do not watch their science fail on a daily basis. Because they work with large populations rather than with individual cases, public health experts often think with words—for example, the American Public Health Association’s (APHA) goals to “reduce global childhood mortality” and “support global food security.” Goals like these are easy for the thinker with words; the delay between error and the serious consequences of error—a very short timespan for an anesthesiologist—is too long for the public health expert to learn humility or even responsibility. After articulating a principle, the public health expert sees nothing go right or wrong for years, if ever, and so the value of the words can only be judged by their good intentions. .. Public health is ideological because all ideologies contain an element of hope and aspiration that can only be dampened by contact with reality. An ideology is a big set of ideas, a sweeping philosophy relevant on a large scale and for a long period of time. It thrives by ignoring details; it is so simple in its explanations that a single slogan can sum it up. Individual cases with particular details detract from the smoothness of an ideological system. Because public health experts do not manage individual cases, reality is less likely to quash their ideological enthusiasm. I could quote much more from this article, but I will leave you with a few one liners and urge you to read the whole thing. Doctors respect science, and most of what they do is anchored in science; but they will ignore science if the situation demands it. Because many Americans think science is the last word on the art of thinking, public health’s historical connection gives the field cachet. Public health activists are clever enough to understand the scientific method, but they are not clever enough to understand its limits. The scientific method gives them an agility that others lack, but it also gives them the bad habit of believing that all is accomplished when they have indulged in a process of reasoning that has the aura of truth. The UK Health Forum received around £300,000 in government funding last year, a fraction of the over £1m it received in 2016-17. In particular, it lost £200,000 in core funding from the Department of Health and Social Care, which the charity’s latest annual report described as a “significant” blow. Alas, the article doesn't detail the 'vital services' that have supposedly been supplied by the UK Health Forum. 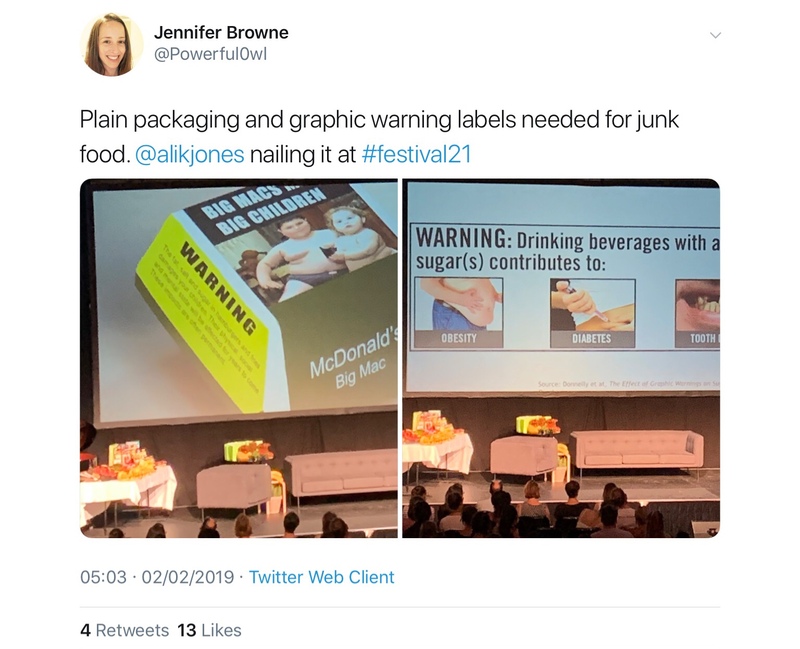 In truth, it is a slush fund for 'public health' activists to lobby for the usual assortment of paternalistic anti-market interventions in lifestyle choices. In recent months, it has promoted higher tobacco taxes, food taxes, advertising bans, sugar taxes and minimum pricing. The UK Health Forum received £216,306 from the Department of Health in 2016/17 in addition to £680,000 from Public Health England and an unrestricted grant of £371,660 from the European Commission. Of a total budget of £1,597,619, its state funding amounted to £1,470,626 (92 per cent). A third of its staff earn more than £60,000 per annum. The UK Health Forum is effectively an arm of the state. It says that it is having to close down in May due to “fewer opportunities to bid for funding for policy work". Good. Taxpayers' money should never be used to pay unaccountable private organisations to do 'policy work'. The sums given to this sockpuppet organisation were obscene and it is appalling that it has taken so long for the government to do something about it. It doesn't seem to have occurred to the UK Health Forum to do what most charities do and raise money from the general public. They probably know that there is no public demand for their 'vital services' and that they would not raise a brass farthing. Hopefully, the millions of pounds that these quangocrats would have siphoned from the taxpayer over the next decade will be used to provide healthcare rather than cushy jobs for perennial gravy train occupants like Simon 'caps lock' Capewell and Robin Ireland. There is also evidence that during the high inflationary period of 2008-2010, promotions were a useful coping strategy for shoppers to manage the worst effects of food and drink inflation. Promotions at this level do of course play a role in helping shoppers reduce the cost of the items that they choose to buy. Based on the breadth and depth of promotions we can calculate a “giveaway” figure which equates to a 16% or approximately £634 reduction on a typical household’s annual, take home food and drink bill. £634 a year! And the government is seriously considering this?! To be fair, this is an estimate of how much extra people would need to spend if they carried on buying the same quantities of the same products. Presumably, the price effect would make the real figure somewhat lower. Kantar didn't estimate what the real figure would be, but their report suggests that discounting leads to a 22 per cent increase in sales. If we take off 22 per cent, we are still looking at household spending an extra £500 a year. We can also expect shops to lower regular prices and offer temporary multi-buy deals (which won't be banned). This will cushion the effect further but the net cost to the average consumer is unlikely to be zero and for hard-pressed consumers who rely on discounts, it is likely to be substantial. Moreover, the Kantar estimate is based only on a ban on discounting sugary products. Back in 2015, Public Health England were still pretending that the war on food would start and end with the battle against sugar. Things have moved pretty swiftly since then and the current proposal is for a ban on all multi-buys for all HFSS food (or all HFSS food in the reformulation scheme, which is most of it) in all shops, restaurants, cafés, pubs, petrol stations etc. As defined by the puritanical Nutrient Profiling Model, HFSS includes pretty much everything that isn't a raw ingredient or a health food and Public Health England is in the process of raising the bar even higher. 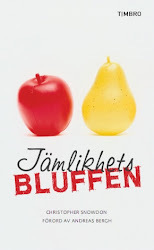 HFSS food already includes such 'junk food' as dried fruit, hummus, pesto, ham, olive bread, cheese and margarine. It will soon include freshly squeezed orange juice and most high-fibre breakfast cereals. If a ban on the promotion of sugary products is going to clobber consumers, a ban on all HFSS promotion is going to cost them a lot more. So what is the putative health benefit of this grand financial imposition? The answer is tucked away in the Impact Assessment. The expected reduction in calorie intake for children from the government's preferred option ranges from er, seven to nine calories a day. If this sounds utterly negligible to you, you are right. The Impact Assessment notes that 'overweight and obese children consume between 140 and 500 excess calories per day for boys and between 160 and 290 for girls'. How can any government think it's fair or reasonable to force ordinary households to spend hundreds of pounds a year to reduce their children's calorie intake by this pitiful amount, especially when the vast majority of children are not overweight or obese? But don't worry because the Impact Assessment has run the numbers and concludes, contrary to Kantar, that the policy will not cost consumers a penny. Its authors happen to use exactly the right assumptions and price elasticities for it to leave consumers no worth off and no better off than they were before. Meanwhile, the tiny reduction in predicted calorie intake will save billions of fictitious pounds over a 25 year period. Seems legit! At the Spectator, I ask why alcohol-related deaths haven't been falling despite alcohol consumption falling sharply since 2005. This poses a problem for the modern ‘public health’ lobby for whom it is axiomatic that a decline in overall consumption must lead to a decline in alcohol-related deaths. This axiom was first proposed by the French mathematician Sully Ledermann in the 1950s and was endorsed by the epidemiologist Geoffrey Rose in the 1980s when he developed his ‘single distribution theory’. In his 1992 book The Strategy of Preventive Medicine, Rose claimed that ‘from the average alcohol intake of a population one can predict precisely the number of heavy drinkers’. As covered by City AM (and no one else, as far as I can see), the World Bank has produced a report about the illicit tobacco trade. The tobacco industry commonly argues that higher taxes and prices (as well as other tobacco control measures), will motivate customers to buy illegal products rather than smoking less or quittin, and that this will impact tax revenue without a decline in tobacco use. Numerous empirical analyses, across a diversity of countries - including the case studies presented in this report - refute this argument. The suggestion that increasing tobacco duty does not lead to more black market activity does not reflect bitter, real world experience and is not even borne out by the report itself. It is fitting that the first chapter looks at Australia which had a negligible illicit trade in tobacco ten years ago but now has an endemic problem thanks to exceptionally high taxes. Contrary to the top line of the report, the authors of that chapter acknowledge that tobacco tax rises may 'heighten incentives for criminals to expand the illicit tobacco market’ and ‘can work to stimulate the trade in illicit tobacco products by decreasing the affordability of tax-paid tobacco and increasing profitability for those undertaking illegal activities.’ This should be obvious. Similarly, in the chapter on Ireland, it says: ‘A high rate of tobacco excise, and the consequent high price of tobacco products, make Ireland attractive to those involved in the illicit tobacco trade.’No kidding. The chapter on the UK notes that: ‘Following a series of tax rises, the illicit tobacco trade increased rapidly in the 1990s.’ The authors go on to claim that the illicit trade was brought under control in the first decade of this century by increased enforcement. Whilst enforcement doubtless played a part, a more likely explanation is that tobacco duty was frozen in real terms from 2001 until 2008. In recent years, however, there have been large, above-inflation tax rises and, unsurprisingly, the share of the illicit market has grown. What a coincidence. 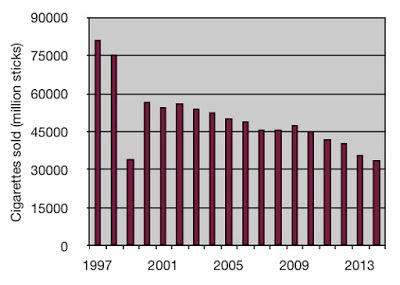 Incredibly, the authors portray Britain as a success story because the size of its black market declined after the boom year for booze cruises of 1999 (the impact on legal cigarette sales of that little splurge can be clearly seen below). According to HMRC, the UK government lost between £1.7 billion and £3.2 billion of tax revenue in 2016/17 thanks to black and grey market tobacco sales. This is considerably more than was lost in 2010/11 and is only slightly less than was lost in 2005/06, despite there being far fewer smokers around today. If this is a success, I’d hate to see what failure looks like. The UK experience underlines that eradicating smuggling is an issue of enforcement. Cutting tobacco taxes is not an effective method of reducing the illicit trade. The idea that the UK has any lessons to teach about 'eradicating (!) smuggling' is genuinely laughable. It has one of the biggest - if not the biggest - problems with illicit tobacco in Europe. 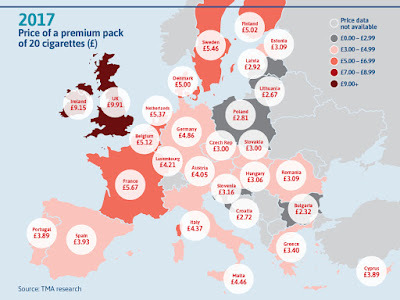 As for the notion that cutting taxes would not reduce the illicit trade, imagine if cigarettes in the UK cost the same as they do in, say, Spain (around £4). Would British smokers still go to Spain to buy their cigarettes? Would they still buy cigarettes from a man down the pub for £5? Obviously not. The idea is ludicrous. It is delusional to deny the relationship between price (driven by tax) and illicit activity. Money is literally the only incentive for buying and selling illicit cigarettes. This is not to say that there are not things governments can do to alleviate the problem, but the problem wouldn't exist at all without sin taxes. There is a strong and consistent relationship between the magnitude of tobacco taxation and the size of the illicit market. In the EU, countries such as Britain and France, which have the most punitive taxes, have the biggest black markets. In New York, which has the US’s highest tobacco taxes, more than half of the cigarettes smoked are bought out of state. You already know this, of course, because you are not an idiot. Who does Ms Dutta think she's kidding? The image of the plain packaged Big Mac has been around for a while. 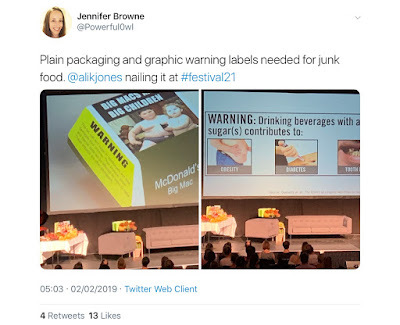 I'm not sure of its provenance but I used it in a blog post five years ago when activist-academics put out a study promoting plain packaging for food. An Australian wowser was using it in 2015 for the same purpose. In other words, it's not a new idea. It's something that the 'public health' lobby has had in mind from the moment plain packaging was introduced for tobacco. I refer you to the words of Robert Conquest. PS. From the same account and the same conference. This tweet has been very popular recently. It seems to be implying that Britain's record level of employment is an illusion and that the figures are inflated by loads of chronically underemployed people on zero-hours contracts. BBC Reality Check asked the Office for National Statistics (ONS) whether working just one hour a week was all that was needed to be officially classified as employed? This is a fairly easy claim to check and so I did. 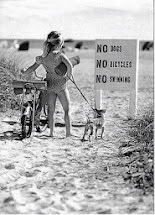 Have a read at the IEA blog. The proximity and density of fast food outlets in an area has no relationship with the number of people who are obese. Anyone who looks at the empirical evidence, of which there is plenty, can see that. And so it is no surprise that zoning laws which restrict fast food outlets have no impact on obesity. They didn't work when they were tried on a grand scale in Los Angeles and there is growing evidence that they don't work when virtue-signalling councils suppress competition by introducing them near schools in England. A Times analysis shows preventing shops from opening in the areas around schools has had little impact on levels of childhood obesity in those areas. .. The Times looked at 13 schemes introduced since 2008, including bans on fast food vans trading outside school gates, limits on weekday opening hours of takeaway shops close to schools and rejections of planning applications for new ones to be built within 400 metres of a school. In nine of the councils, obesity rates among pupils in their final year of primary school had increased, according to government data. Council chiefs said they were fighting a losing battle in the face of delivery apps such as Deliveroo, Uber Eats and JustEat. Last week it emerged that Uber Eats couriers had been willing to deliver McDonald’s meals to school addresses. Takeaway shops have always done deliveries. It is highly unlikely that giving people the ability to order on the internet rather than over the phone has made any real difference. It is much more likely that councils are using the apps as an excuse for the inevitable failure of their zoning policies. If 'public health' was an evidence-based endeavour, these policies would be ditched (how many times have I said that over the years?). But they won't be.